The London Olympics are on in our house, pretty much non-stop. We love it! We did some Olympic laundry today. We played some Olympic softball today. (We won! We won! USA! USA!) We did some Olympic baby wrestling on the floor today. I did some Olympic cooking today. In honor of the British hosts, I made a spin off of Coronation Chicken. I have no idea if this salad is actually served at a coronation, but the title inspired me and the Olympic fever fueled me. Mango Chili Chicken Salad - inspired by Nigella Lawson's "Coronation Chicken"
Preheat the grill. Zest and juice limes and stir in oils. Add chicken to marinade and add salt and pepper. Arranged the butter lettuce and chopped cilantro in a large bowl. 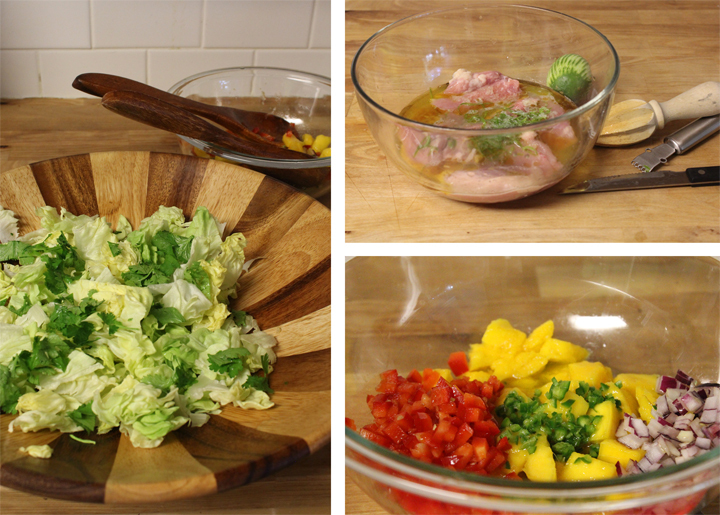 In a separate bowl, mix the dressing - minus the sesame oil. In a third bowl, add chopped mango, chili, red bell pepper, and onion. Grill chicken, and set aside to rest. Now that the chilli, peppers, onions and mango have had a chance to rest together, mix the dressing in with the fruit and veggies. Toss with the lettuce and cilantro. Plate the salad and slice the cooled chicken. 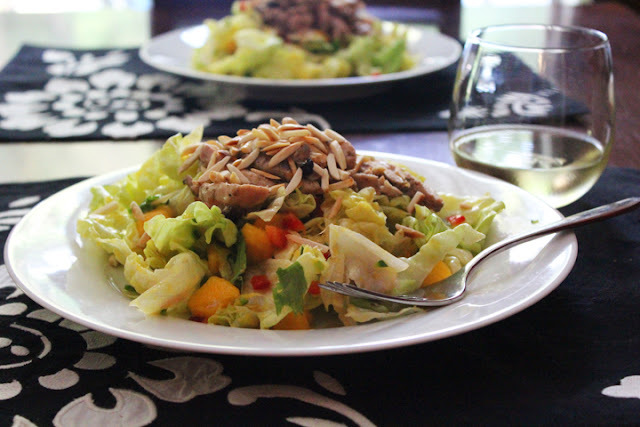 Top with chicken and toasted almonds and drizzle the salad with sesame oil. This salad was delicious, but it was spicy! We like spicy salads... as you may remember, but the serrano packed some kick. You can soak chillies in cold water for a while before chopping them to mellow them out. If you don't like spicy stuff, a diced green bell pepper would be just as pretty. This salad, minus the chicken would be great along side a piece of light fish.